Ships, as we know can carry large volumes of cargo. In the earlier days, the goods would be packed into small boxes and these were then manually loaded by individuals who would climb the ship’s ladder (gangway), offloading them into the holds. These goods were stacked manually and the entire operation would take days depending upon size of the ship. With the advent of mechanical means such as cranes and derricks, heavier loads could be easily hoisted from jetty to the ship’s hold. However, the packages were still smaller in size and cranes couldn’t be used to their full capacity. A substantial cost of shipping went into paying the dock workers for loading and unloading of the cargo. A few docks decided to put cranes and mechanical means to greater effect and for that they needed the packages to be much larger and at the same time to have the same yardstick in size. This was the beginning of Unitization. The idea caught on as other docks saw it’s potential and began implementing it in their own ports. Today, the size of ships and the variety of cargo handled has gone up so much, that to be able to handle such large volumes efficiently, the cargo needs to be kept in a methodical and well planned manner. Unitization comes to our aid in such situations. Unitization is essentially grouped or bundled cargo, wrapped into packages and loaded onto or inside a bigger unit. These bigger units can then be handled by machines such as forklifts and cranes. Because of the bigger size, the number of individual units to be loaded on the ships reduces; saving time and effort, increasing efficiency and lowering the chances of late deliveries. A new method called pre-slinging came into existence to transfer cargoes like large pipes and steel cables. The entire cargo is shipped, along with slings as slung from the port of origin. At the port of delivery, the cargo can be directly offloaded without the hassle of lifting it manually to get the sling pass underneath. The focus of unitization was standardization of the shipment as it would make the work of mechanical machinery more efficient and frugal. The efficiency of cargo handling increases as heavier units can combine many smaller packages into one large package. The safety of cargo increases as cranes are used to lift the load vertically upwards using slings. The slings can be made strong enough to withstand loads several times more than the load being lifted. Previously the cargo had to be carried manually by individuals or lifted up using pulley and rope; many a times this resulted in cargo getting damaged. The labor required is reduced drastically, thus resulting in cost saving. The loading and unloading time reduces. Ships, trucks, railway wagons have to wait idle for lesser duration. The time spent by ships at ports is reduced to a great extent, making voyages shorter. The disadvantage is that many unskilled and semi-skilled labors lose their job. The working environment changes and earlier employees and their work become vague. The most common form of unitization is palletization. The forklifts and cranes are designed to handle certain dimensions of package. The pallet is made to this dimension and acts as a platform for cartons and boxes to be stacked on top of it. The entire pallet then becomes a single unit with the cargo secured tightly onto the pallet base. The materials for pallets can be hard wood, soft wood, steel, plastic and even fiber board depending on the voyage, type of safety required and reusability. 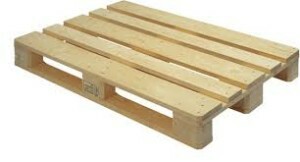 Since the use of pallets is so handy, they are used all over the world. Hence, pallets also have regulations that set the standards for its size, durability and load carrying capacity. Below is the ISO Standards (ISO 6780) for pallet dimensions. The next big step in unitization was containerization. It all began as noble idea of a US based businessman Malcolm Mclean, who modified a Second World War tanker vessel to carry boxes known as containers. The vessel was named Maxton and began sailing in the year 1956. The cargo would be loaded into these boxes, which were capable of being placed directly onto the trucks. This saved a lot of time compared to break-bulk carriers. The ship was modified to carry 60 such boxes as deck cargo. By 1970s, container shipping started getting a boost from Europe and Japan, and the rest of the world soon followed suit. Containerization brought about a paradigm shift in shipping logistics. There are two standard lengths of containers largely used worldwide. The 20 feet and 40 feet containers also called TEUs (Twenty-foot Equivalent Units) and FEUs (Forty-foot Equivalent Units) respectively. These containers referred to as freight or shipping containers are intermodal in nature, i.e., they can be transported via rail, truck and ships with equal ease. The reason why we are saying that containers have brought such a paradigm shift is because of the fact that, the actual handling of the cargo is negligible. It is the container that is being handled in all the transportation including trucks, trains, cranes specially designed to load them on the ship, and the entire ship itself. The whole process of packing and unpacking the product is carried out by the manufacturer or shipper at their premises or at container freight stations (CFS), leaving ship and port authorities to manage other important parts of the job. The cargo remains safe inside a metal case and additional packaging is not required as opposed to palletizing. Faster turnaround time for ships due to mechanization of container handling. The ships leave the ports within hours of arrival which was not possible in the non-container era. A single ship can carry thousands of such freight containers thus benefitting from economies of scale. The harbors became more advanced in handling of such containers lending to their overall development. There are several varieties of freight containers to choose from depending upon the type of cargo, loading and unloading methods used. These are dry storage, flat rack, open top, open side storage, double door, refrigerated or reefers, insulated or thermal, tanks (for liquid cargo), cargo storage roll, half height, car carrier, intermediate bulk shift and special or customized containers. As long as the dimensions of containers remain true to the standards set by ISO, they can be made in any shape and used for whichever application. You can read more about container types and specifications on our blog post here.